Planning a home vegetable garden is a great way to provide fresh delicious vegetables for your family. Here are some tips and ideas for a planting a container, French intensive or Hugelkultur vegetable garden. Watch our garden planning video below for more ideas! These are all vegetable garden plans that work well for planting a small but successful home garden. You will need to choose a location with plenty of sunlight for your vegetable garden location, and a convenient source of water nearby. Find the vegetable garden planting times for your area by asking your local garden center, or an experienced gardener in your area. Or you can download our free zone chart and planting guide. Then get ready to have an exciting garden adventure, as each garden you plant will be a unique experience depending on the weather conditions and vegetable seeds and plants that you select! 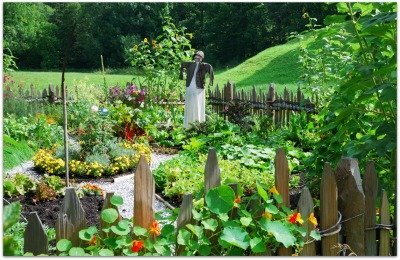 Traditional backyard gardens are planted directly in the ground. Choose a sunny location near a convenient source of water. Remove all grass and weeds from the area. Take soil sample to your local extension service, or gardening center that provides soil tests, and determine what corrections or additions are needed to provide healthy soil for your garden. 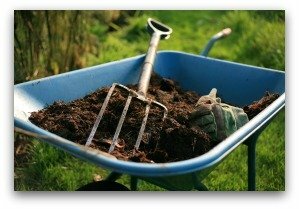 Most soils require conditioners such as compost, organic fertilizer, or lime to sweeten the soil. Most gardeners use a rototiller to prepare the garden soil for planting. It can be done by hand with a spade, especially for small garden plots. Be prepared to spend time each week removing weeds from your garden! Each time it rains, or you water your garden, weed seeds in the soil will sprout and begin to grow. It is much easier to remove them with a hoe when they are tiny, than to try to kill them later! Weeds rob nutrients and water from the soil that will be needed by your vegetable plants, so it is quite important to keep them out! A container vegetable garden is one of the easiest gardens for a beginner to grow. Simply recycle or purchase fairly large containers (3-5 gallon size works well) with drainage holes, fill them with enriched potting soil, and plant your garden with your favorite vegetables. 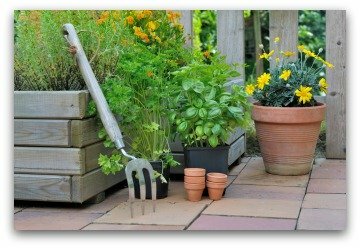 Growing tomatoes, cucumbers, lettuce, radishes, onions, parsley, peppers, and carrots in container gardens is quite simple as long as you have a sunny location on your porch, patio, deck, balcony or in a flower-bed on which to place your containers. Follow directions on the individual seed packets for planting and spacing instructions. Tomatoes and cucumbers will grow best in containers if you provide a "cage" to support them. 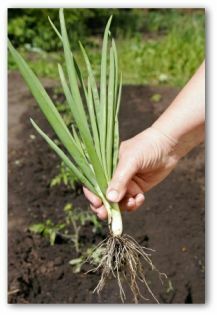 Lettuce, radishes and onions can be planted every 3 weeks to ensure a continual harvest throughout the growing season. 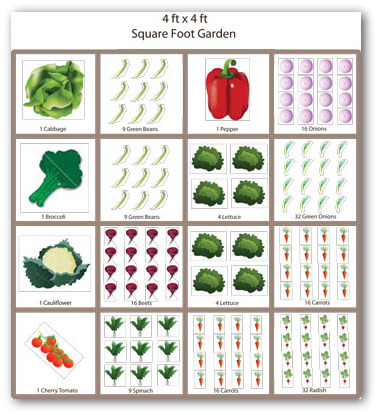 Square foot gardens are a great way to grow lots of vegetables in a small amount of space. Layout one 4' x 4' garden space for each person in your family. 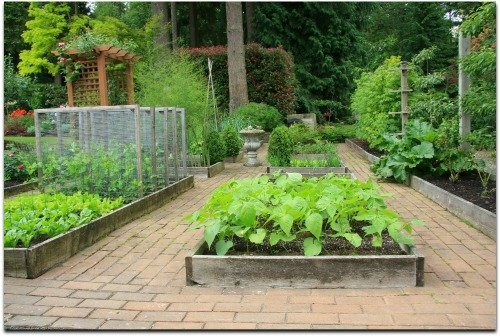 This type of vegetable garden can be in-ground or raised bed. Mark the one foot squares with string or strips of wood. 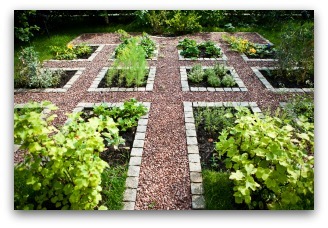 Plant one type of vegetable in each of the 16 squares. 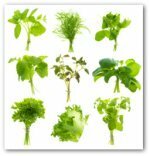 Thin or plant to 3 inches, plant 16 per square foot. 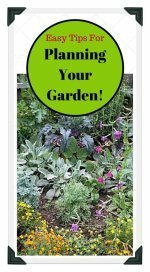 This applies to everything you plant in your square foot garden; vegetables, herbs and flowers. 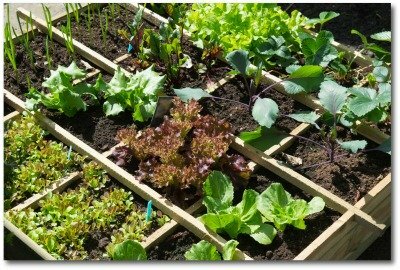 Square foot gardens are a very simple and easy way to grow a good variety of vegetables in a very small space. They are super easy to plan, plant, and care for. 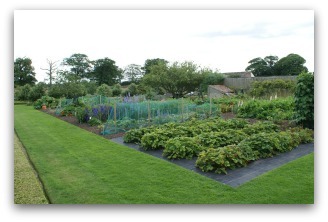 One variation of planting a traditional home vegetable garden is the French intensive method. The French intensive method of double digging increases harvest size for a small home vegetable garden. By providing the plants over a foot of loose, aerated soil, the roots will grow downwards instead of spreading out along the surface. This method has the additional benefit of protecting the plants from drought conditions. Be advised, the French double dig system is not for the faint of heart! As the name implies, it will be twice the work investment but on the other hand it can more than double your production. 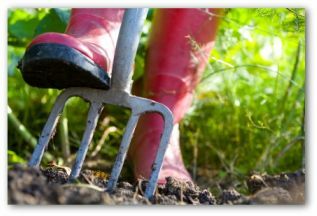 Digging in the dirt can be difficult, but the aim is worthwhile in maintaining excellent soil structure. Certain microbes only live in the top inch of soil while others always live a foot below. When you change its places, the organisms could die and cost you valuable fertile soil. This method requires attention to where the shovelfuls of dirt land. 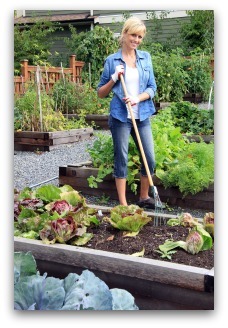 After you lay out the size of your home vegetable garden, mark it cross-ways into strips the width of the shovel. 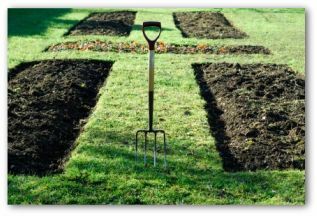 Dig your first trench, placing the removed dirt in a pile or wheelbarrow. Throw compost several inches deep in the bottom of the freshly dug trench. Turn the compost into the subsoil. Dig a second trench and place its displaced soil on top of the first trench dug. Add compost to the second hole’s exposed level. The last trench dug will be filled with the topsoil from the first trench after compost is added. When you take dirt from the bottom, it needs to return to the bottom. Luckily, the majority of the work is done up-front. Mulch the top and sides to prevent erosion. Over time, the mound will shrink, and earthworms will loosen the soil underneath, giving plants vital rooting room to grow. Sheet mulching is not as backbreaking work as shoveling dirt. Although, since it is a no-dig no-till system, it does require time to complete the task properly. A similar method is lasagna gardening. Decide which strategy works best depending on what materials, and how much time you have available to devote to preparing a home vegetable garden. The idea is to allow the vegetables to become a part of the composting process, as it happens naturally. Hugelkultur is an interesting technique for preparing soil for a home vegetable garden. Potatoes and vine plants are known to thrive using this method. It uses discarded tree limbs that we often have plenty of scattered about our lawns, especially after wind or thunderstorms. Using the Hugelkultur procedure, make a pile of twigs and branches a couple of feet deep, and compact the wood by stomping it down. Fill in the open spaces with materials such as straw or grass trimmings. Add a thin layer of compost, an inch of topsoil on top, and you are ready to plant your seeds! The rotting wood slowly fertilizes your home vegetable garden, making plants more productive. This is an interesting gardening method to try if you have a backyard, and tree limbs or branches to dispose of. Planning a home vegetable garden is a great way to have an outdoor adventure, while providing some fresh delicious home-grown food for your family. Depending on your space and the amount of time you have available, you can find a method that works best for you. If you are not sure which to try, just choose the garden type that seems easiest to you. You can always select a different type garden next year! You will learn new things with each garden, and before you know it, you will be an experienced gardener.